Per my review of Wayne Shorter's 1966 hard-bop classic, here's my review of Larry Young's contribution to that legendary year in Jazz music. Any jazz record featuring Elvin Jones and his solo breaks is a guaranteed success. Well, 1966 has a new face in my book, and one that I am pretty positive I will be staring at for quite some time into the future. 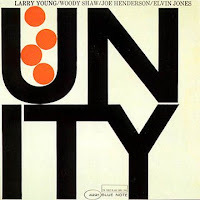 That face would be Larry Young's Unity, a fairly standard Blue Note release, produced and contributed to by trumpeter Woody Shaw and experimental saxophonist Joe Henderson. One listen concludes a fairly straight-forward approach similar to much of Herbie Hancock's earlier work, though there is a thin layer of experimentation in random momentary flashes that you will probably miss if you're not listening intently. I've never been one to scrutinize any classic or modern jazz release, because I allow myself just a pinch too much of an emotional high, which is pretty much what jazz is all about to me, but like Coltrane's A Love Supreme or Shorter's Speak No Evil, there is something there, under the surface music; something containing pure energy, pure talent, pure love. It isn't necessarily meant to be listened to, exactly; it's meant to be experienced as a whole. People make jazz way too hard. What is hard about true love, freedom, happiness? They're there, and we experience them, whether we think we do or not. To the highest degree, Unity is another classic release I have only recently discovered that I immediately recognized that spiritual element contained somewhere within. If you didn't know any better, you'd mistake Henderson for Coltrane. It's a little eerie, honestly. Henderson seems to be speaking Coltrane's language most of the time, and yet there obviously isn't that little spark, that brightness that Coltrane conjures up soulfully. Then again, Larry Young is indeed under the spotlight here, just as Coltrane was in his recordings, so I can't expect too, too much from Henderson. Woody Shaw shines at times, though mostly weaves a melodic tapestry over which Young can freely improvise, and that's ok - I am digging that soft organ. It's refreshing. Overall, the whole album seems to take Coltrane captive at times, yet does not allow his influence to keep the music from sounding Dave Holland-esque the majority of the time. These are good qualities, and like I said, the album shines Young's light into the world, and one that seems just as bright now as it did then.